Product prices and availability are accurate as of 2019-04-19 08:53:12 EDT and are subject to change. Any price and availability information displayed on http://www.amazon.com/ at the time of purchase will apply to the purchase of this product. Waist 26-28" / Bust 34-36" / Hips 36-38"
Waist 28-30" / Bust 36-38" / Hips 38-40"
Waist 30-32" / Bust 38-40" / Hips 40-42"
1.Will the bottoms come up past my belly button? - Yes. 2.Does this have underwire? - Yes. 3.Is the top padded? Supportive? - Yes the top is padded and gives pretty good support. 1.If you're between sizes, it's usually best to order the LARGER size so you have room to move, or some alterations can easily be made. 3.The suit measurements are for reference only. Please allow ±0.25" difference for actual suit measurement. 4.Wash in Cold Water, Mild Soap Lay and Hang Dry. High waisted tummy control bottom - the bottom features in front lined, plays double-duty as retro style and tummy control. The ruching on the front panel is an extremely flattering way to camouflage the problem areas. Halter push up top - ties at the neck and back, adjustable halter design allows for a comfortable fit. It features underwired supportive construction with lightly molded cups. Comfortable and breathable material - 88%polyester + 12%spandex. 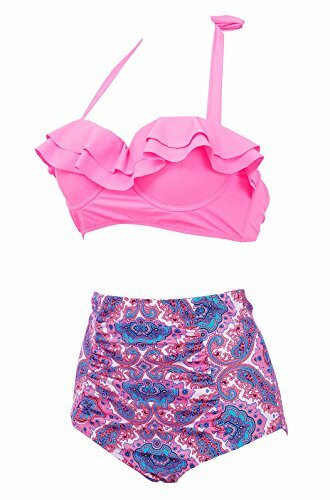 Perfect for summer bathing suits, casual, beach, swimming, beachwear, party, vacation. Item care instruction - hand wash, flat out to dry, ventilated. Please refer to our detailed size chart below the product description before you purchase. If you're between sizes, it's usually best to order the LARGER size so you have room to move, or some alterations can easily be made.